outherners are recognized as being hospitable, and one of the most notable forms of welcome is a well-made biscuit,” says Chef Matthew Krenz, formerly of The Asbury in Charlotte, where his popular Sticky Biscuits still welcome diners. Butter, cinnamon, and sugar are spread onto buttermilk biscuit dough and topped with chopped Benton’s country ham. The dough is rolled up, sliced, baked, and then drizzled with goat cheese icing. It’s a biscuit — and so much more. The sweet, glazed cinnamon biscuits at the Dan’l Boone Inn in Boone are crowd-pleasers, too. And at Sweet Potatoes in Winston-Salem, the restaurant’s namesake vegetable sweetens the biscuits. They form the base for eggs Benedict and breakfast sandwiches at Sunday brunch, and miniature versions of the biscuits appear at lunch and dinner, too. Sweet potatoes and thyme flavor one of the many creative biscuit varieties at Wilmington’s Rolled & Baked. 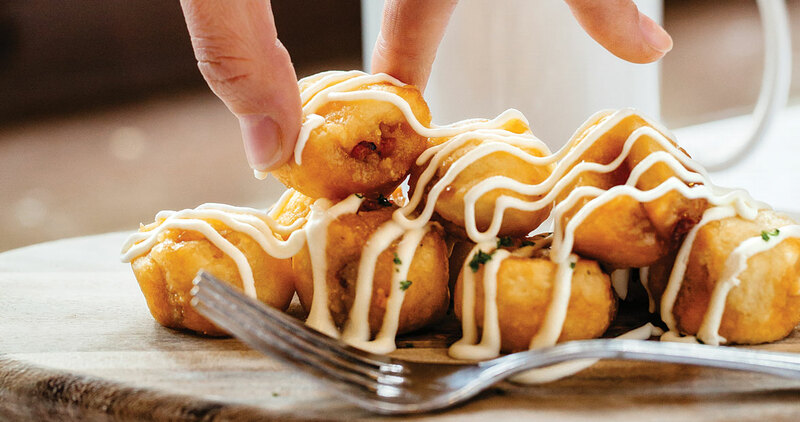 Chef Micah Edelstein, a former Top Chef contestant and a culinary consultant for the restaurant, says that the menu features “biscuits for the bold.” Biscuit tapas and Parmesan-basil biscuits, anyone? That’s some memorable hospitality.